Neoprene is a black commercial grade compound for use in factory applications where resistance to oil is necessary. This elastomer is made by the polymerization of Chloroprene. It has excellent physical properties. It is moderately resistant to petroleum products, sunlight, ozone and heat. 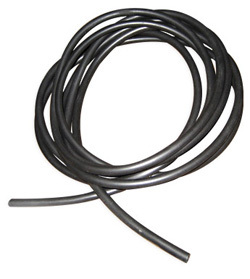 Useful temperature range is -30° F to +220° F. Neoprene tubing's ability to withstand a large range of temperatures allows it to be used in a variety of intense indoor or outdoor applications. Have questions about which chemicals can be used with nepoprene tubing?